Tom Kepler Writing: I Almost Buy a Motorcycle--This Week! I Almost Buy a Motorcycle--This Week! It's true--I was thinking about buying a motorcycle. I owned a Honda 250 Scrambler back in 1970--right until I was in a motorcycle accident. Then I sold my motorcycle, my sports car (an Austin Healey), and bought a Cadillac--a tank of a car. Perhaps this was an over-reaction, but I had received substantial proof of my mortality. Even at eighteen years of age I got the message. Besides, the Austin Healey, a great sports car, was also, unfortunately, a completely worn out piece of junk. When I owned a motorcycle, I loved the sensational experience of riding it--in the literal meaning of the word sensational. Riding a motorcycle is a physical, sensory-stimulating experience. 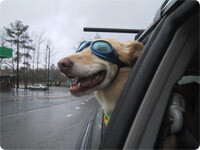 Think of a dog with its head out the car window. However, I also have the memory of that car pulling out in front of me and I having nowhere to go. I remember asking my parents, "Why did you let me buy a motorcycle?" as I sat at the emergency ward, my elbow burst through the skin. My mortality and my responsibility to my family comprised part of my choice not to buy a motorcycle. The other half of my choice was just plain logic. 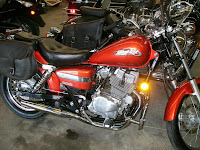 I know that if I bought a motorcycle, I wouldn't go for long rides or extended trips. It would be almost completely for zipping around town. Ten or fifteen minutes of riding my bike gets me anywhere in town. Then question is this: Why buy and maintain a motorcycle to do what I already can do with my bicycle, with greater health benefits and with no petrochemical environmental downside? I had to admit there were no good reasons for buying a motorcycle, considering my needs--only cool reasons. I could have argued with myself that one is no safer on a bicycle than on a motorcycle, but that isn't entirely true. The greater speed lessens reaction time for both motorcyclist and car driver. The greater speed increases whatever impacts might occur from losing control. A bicyclist just has more time to make decisions, and if that decision is to head for the ditch, at least it's not at 25+ MPH. 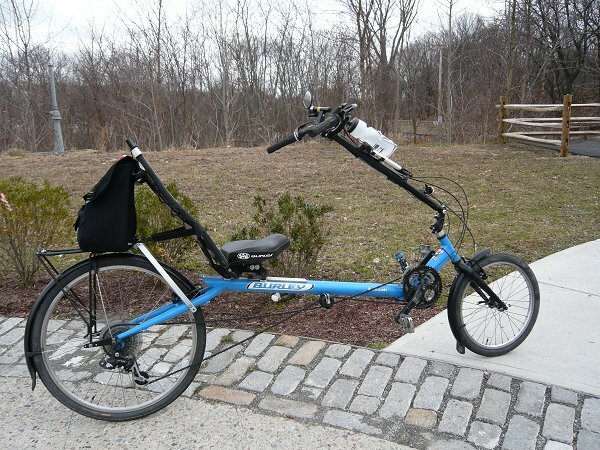 My Burley Koosah recumbent bike is also easier on my body when I ride than a regular diamond frame bicycle; it's more upright, like a motorcycle, and doesn't have that tiny little seat. 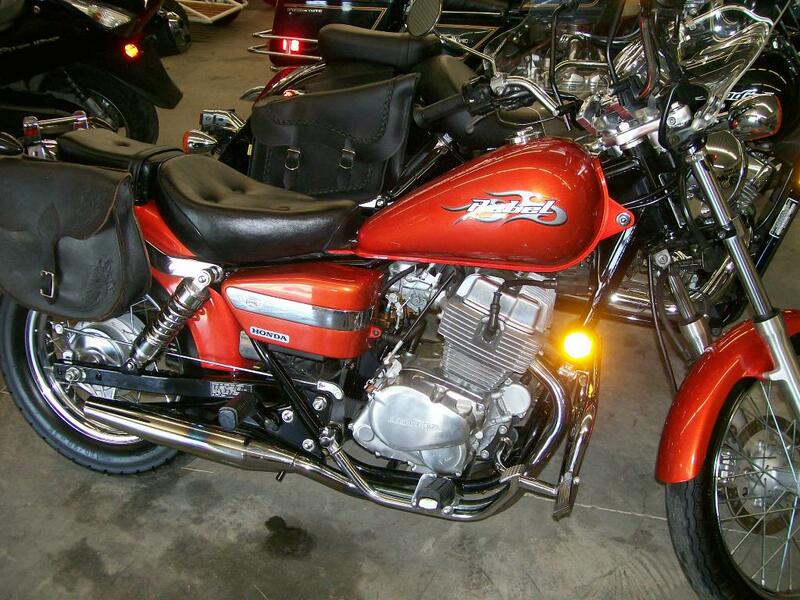 Still, that orange Honda Rebel--the current equivalent of the old Honda 250, is one great-looking bike! Sometimes, though, the memories are better than the realities. I'd be uncomfortable thinking of my wife or son on a motorcycle. I'd worry about crashes. Why should I put my family through that? Or the possibility of that? Better to ride my bike and take to the Jefferson County bike trails system. It's a joy I can live with. I recognize that Koosah. That's my bike! :) I took that shot at the north end of the Blackstone River Bikeway in Rhode Island.